I picked up a copy of Legends of Prince Edward Island when I vacationed there with a friend of mine too many years ago. Honestly, I picked up this book because a.) it was a cheap and b.) I was penny pinching like crazy to be able to afford the trip! I told myself it would help me to understand the Island and Lucy Maud Montgomery's story-telling instincts better and I was right about that. I just took, oh, say 10 years (give or take!) to actually read it! Having just read it from cover to cover, I remember why I only read it halfway! It's full of ghost stories and they can be kinda creepy. I can't imagine I would have cared much to read them back them. Can't say I totally cared to read all of them right now! But I do handle the scare factor a bit better. 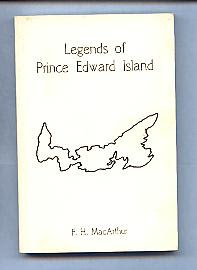 "To our forebearers the pioneers of this Island, who, during the long winter nights of yesteryear, helped entertain each other by narrating such sagas as appear in this unpretentious little volume." "These stories depict Islanders and their mode of life before modern transportation linked the Island Province with the mainland. The book contains a total of fifty-nine stories set against the background of the Garden of the Gulf before the turn of the century. Some of the legends are written in the Island dialect. Many persons and places in the area are actually mentioned by name." Stories of ghosts in the graveyard. Stories where the devil himself makes an appearance (always with a pitchfork so, of course, you know it's him. Mysterious trains traveling in the night. People being turned into mermaids. I did like reading this from the perspective of Lucy Maud Montgomery. Both she and her father were noted as being very good story tellers, as many Islanders are. It's curious to me to hear some of the stories that have circulated around the Island as to the history of it. I particularly enjoyed the stories told in the Island dialect as it helped me to "hear' the voice of the teller. This is not my normal reading fare, to be sure. But it was insightful and some of the stories were downright entertaining and pleasant to read. It's just that most are not. I'm not a fan of ghost stories and have never really understood why people like to scare themselves spitless. This is definitely not my style. But again! Curious nonetheless. Hmm -- don't know that I'd like that one. Not big into ghost stories. When you take tours in Charleston they go into some of that kind of thing, too. I purchased that when I was in PEI myself. I got it because I was kind of desperate for any little piece of the island that I could take away with me and what better than the stories of the people? I dont really think of it as a cover to cover kind of thing. In the couple of years I've owned it I dont think I've read all of the stories I just dip in and out when I want a PEI fix. It's very cool that you would feature the book though :) It's such a shame that a visit to PEI requires such penny pinching isnt it BUT it's definatley worth it. Well, I'm a fan of ghost stories. They're some of what I read when my eyebrows are not clashing against each other in the middle analyzing cognitive complexity, (lol) a heavy bulk of my working life right now. Fairy weddings?! Now that will hold my sanity.